After years of running an auto parts store by day and building hot rods by night, Mom and Dad decided to make the leap into building hot rods full time. The year was 1981 and Bruce’s Rod Shop was born. Fast forward to 1987. After out growing their 4 car garage shop, they decided to make another leap to a much larger 7200 square foot shop. June of 1988 started the second generation of hot rod builders in the shop and I came to work full time. Landlord problems in 1991 forced us to find another location for our shop, but now we had our own building. As the years past, we watched the different styles come and go – dad built the traditional stuff while i built the high tech stuff. 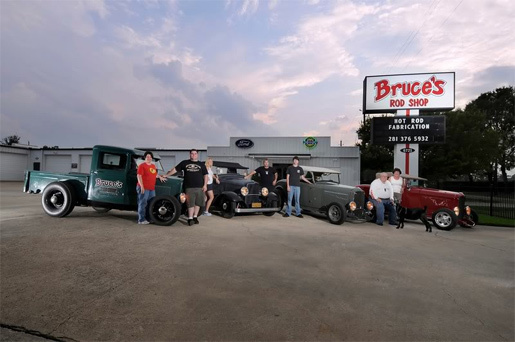 With all ways striving to build the best hot rods in Texas, the word slowly got out that if you want a well built, well detailed hot rod then Bruce’s Rod Shop was the place. Business began to boom. Summer of 2008 was stressful and exciting. My customer’s 15,000 square foot complex next door to our shop came up for sale. Even though business was booming, making that kind of leap needed perfect timing. With the help and guidance of our customers, we moved out of our old shop into our grand new hot rod complex. Right as we moved, the real estate market dropped – leaving our old 7400 square foot shop vacant. A year later began our latest leap. After the remodeling of our old shop, we opened our paint, body and sheet metal shop. The remodel brought the total working space up to 22,000 square feet. Every day it seams like a dream to pull up and see our name on the sign out front. Thank you for stopping by our new web site. If you are ever in the Houston area, please stop by.